No one should see this. : Moogles! 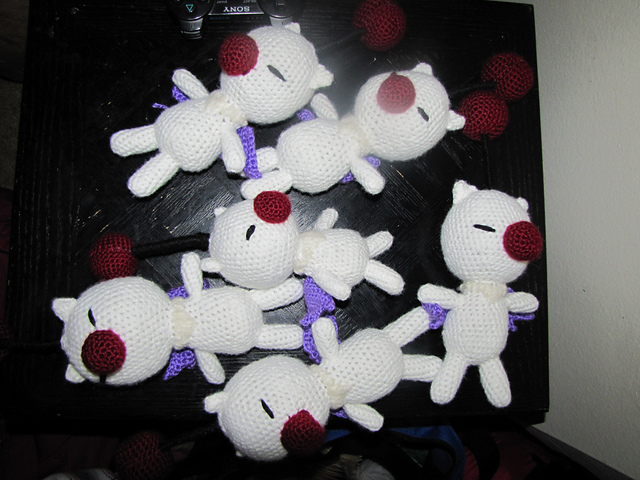 Another project of mine, amigurumi Moogles. I loved this guy to death. Seriously. How cute is he? and here's my notes of what I did- I made a few changes. 12/15/11 I was gonna do the other moogle pattern, but I was inspecting it and realized it was gonna be really tiny, so I switched to this pattern. I wanted a larger doll. I’ll be officially hooking this tonight. 12/16/11 all done! he went together so fast! I could definitely do this in less than a day. probably a couple of hours if I was uninterrupted. I followed the pattern exactly except for the wings. 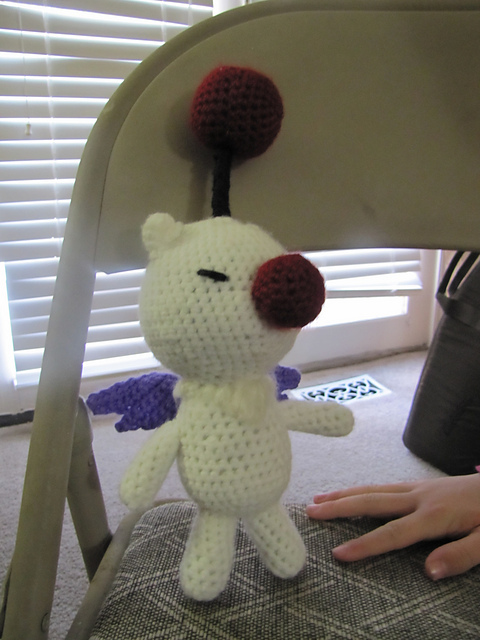 I was afraid the wings with the pattern were too plain so I used the pattern from this moogle: http://magicpixieknitter.blogspot.com/2007/09/quite-bit-later.html the moogle is knit but the wings are crochet and I like them a lot. I also used a bit of my boucle brushed yarn in ivory to do the fuzzy collar bit on his chest. for his bobble, I actually took three pipe cleaners and twisted them together. then I twisted the top part into a circle, used another pipe cleaner to reinforce the circle and then to support the circle to the main stem. as I was sewing the bobble together, I then sewed the ring to the top of the bobble, stuffed and closed. I did a similar thing making a ring at the bottom of the pipe cleaners after poking it through the top of his head and then sewed it to the top of his head. it made a very stable base. if that doesn’t make sense, and you want a better explanation, message me and I’ll try to be clearer, with pictures and whatnot. the bottom line is, his bobble stands and that was what I was going for. I then wrapped the stem in black yarn to neaten it up. I really love this guy. I have decided however to not give him to my daughter, I am not confident that the bobble would stand up to a five year old playing with him. So I’m going to make her something else. Probably a Shaun the Sheep. or a duck. she keeps asking for a stuffed duck…. Incidentally, I was correct, the bobble is not kid proof. I made a bunch of these to sell and a friend of mine bought one for his two year old, which I just KNEW was a bad idea. she had the bobble off in a couple of months. I figured as much. When he asked if I could fix it, I replaced the wire stem with a more kid-friendly braid. Sure, it didn't stand up any more, but the two year old didn't care.